I’m so stoked about this! Stampin’ Up! has released a preview of what the October and November Paper Pumpkin Kits are going to be! Not only do I love plaid, but Christmas is my favorite holiday. This year October and November are going to be coordinating card making AND gift giving kits. Paper Pumpkin has been my go to for easy card making projects and I can’t wait to see what they come up with this time! If you are interested in this, please contact me to sign up BEFORE October 10th to make sure you receive these. For those of you that have not tried Paper Pumpkin yet, here is your chance! 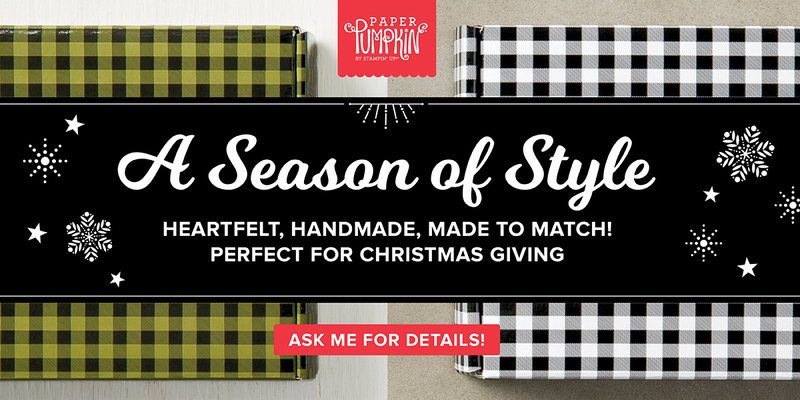 Now through September 10th, you can try Paper Pumpkin for 50% off your first month. Everything you need to make the kit is included in a cute bright orange box delivered right to your door! I’ve been receiving Paper Pumpkin for a little while now and am really enjoying their kits. It’s a great way to start stamping and building both your card stash and stamp stash. For an idea to what you get, I’ve posted the YouTube links for August, July, and June. They are super cute and fun to make! If you have any questions, please don’t hesitate to reach out to me!